This LOMO prototype was announced in 1967. Metal-plastic body with more angular edges. Bi-format 18x24mm or 24x36mm, selected via a simple sliding mask in the viewfinder. Bright-line finder centered on lens axis, with fixed half-frame indicators. Advance lever under the body. 36 or 72 view frame counter. Accessory shoe on the top plate centered on lens axis. Industar-60 2.8/40 mm or Industar-73 2.8/40 mm lens. Shutter with speeds: 1/30s, 1/60s, 1/125s, 1/250s + B. 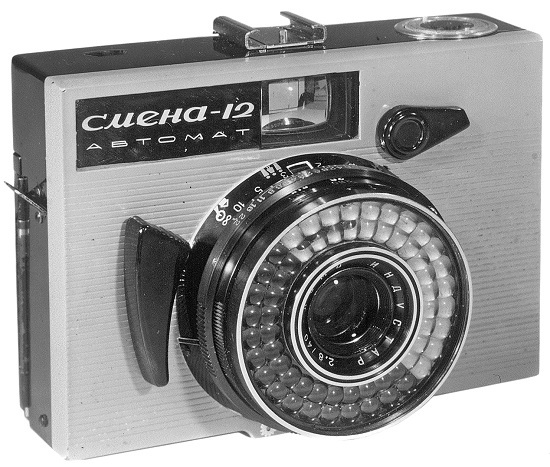 At least 3 versions of this prototype camera are known to exist. 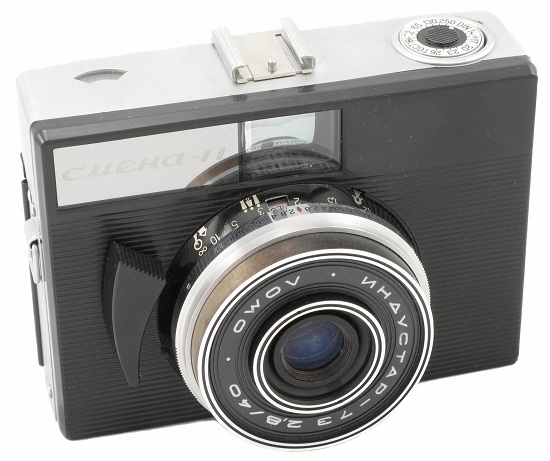 It seems, that an earliest example of Smena-11 comes with Industar-60 2.8/40 lens (PK2855). 2nd is fitted with Industar-73 2.8/40 lens already (PK2860). The 3rd camera has no markings on the lens (PK2865). PK2855. 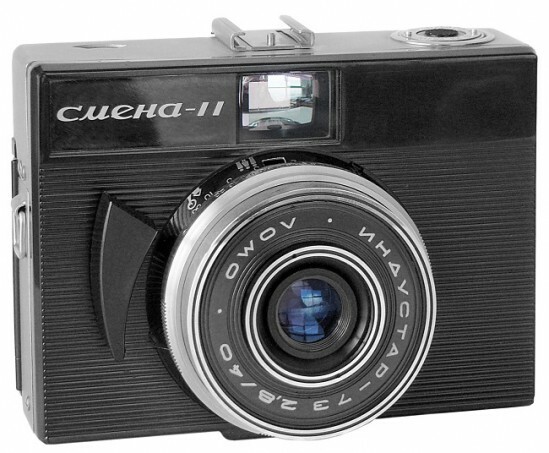 Seems to be an earliest known version of prototype Smena-11 camera. Fitted with Lomo Industar-60 2.8/40 mm lens. An only sample is known to exist in collections. 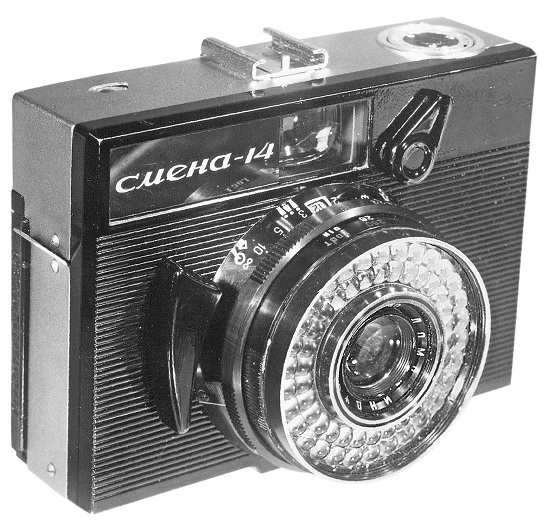 Camera below from SSK book "1200 cameras from the USSR", 2009. 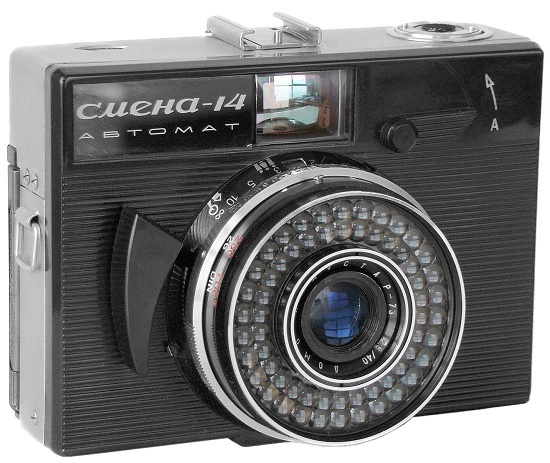 PK2855 - Smena-11 prototype camera. PK2860. Camera identical to PK2855, but fitted with Lomo Industar-73 2.8/40 mm lens. Only few samples are known to exist in collections. PK2860 - Smena-11 prototype camera. PK2865. Camera identical to versions above, but without markings on the lens. An only sample is known to exist in collections. Camera below from Claire&Alain Berry (France) collection. 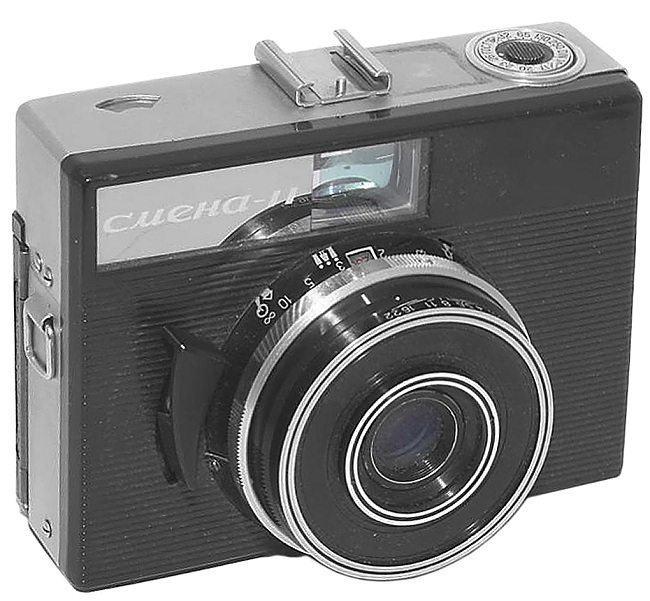 PK2865 - Smena-11 prototype camera. This LOMO prototype was announced in 1967. 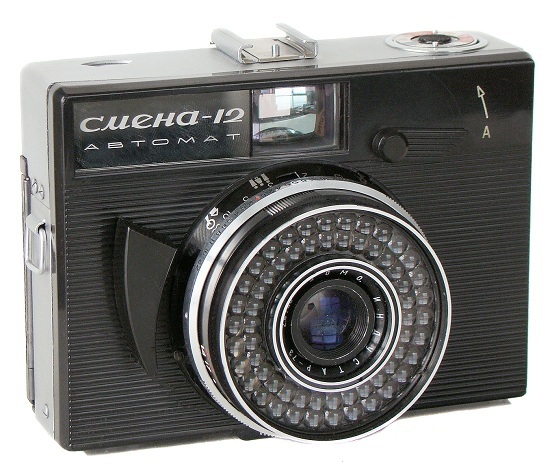 Identical to Smena-11, but with lightmeter surrounding lens. Shutter speed priority automation with single speed 1/60s and B. Diaphragm scale visible in finder. Fitted with Industar 2.8/40 mm or Industar-73 2.8/40 mm lens. PK2900. An extremely rare to find prototype camera with gray painted frontplate. All other camera parts are painted in black. Fitted with Lomo Industar 2.8/40 mm lens. Only few samples are known to exist in collections. Camera below from LOMO (Russia) archives. PK2900 - Smena-12 prototype camera. PK2905. Camera almost identical to PK2900, but totally black body already. Slightly changed body design. Fitted with Lomo Industar-73 2.8/40 mm lens. So far an only sample is known to exist in collections. PK2905 - Smena-12 prototype camera. This LOMO prototype was announced in 1967. 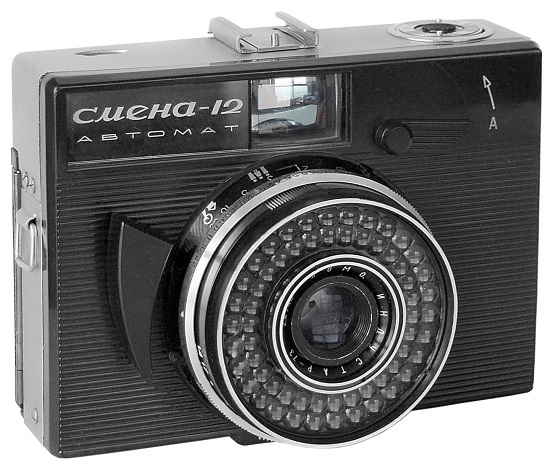 Identical to Smena-12, but with 4 shutter speeds automat: 1/30s, 1/60s, 1/125s, 1/250s. PK2950. An extremely rare to find prototype camera. Fitted with Lomo Industar 2.8/40 mm lens. So far only this sample is known to exist in collections. PK2950 - Smena-14 prototype camera. PK2955. Camera almost identical to PK2950 with slightly changed body design. An aditional markings "Automat" on the nameplate. Fitted with Lomo Industar-73 2.8/40 mm lens. Only very few samples are known to exist in collections. PK2955 - Smena-14 prototype camera. PK3005. 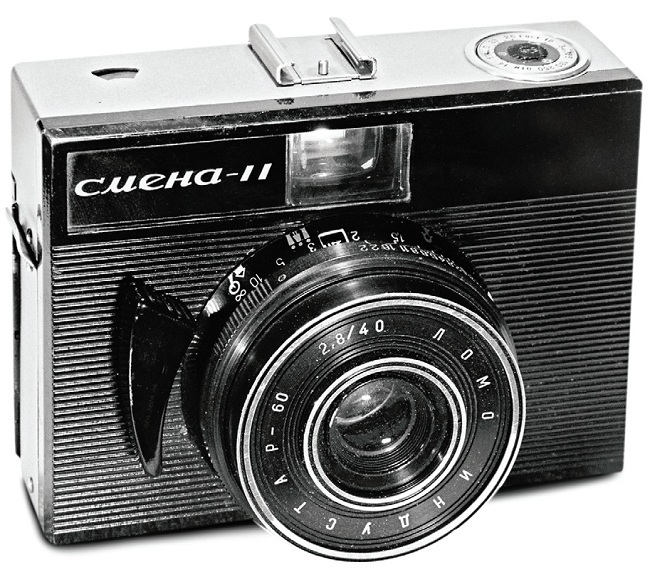 Announced in soviet press in 1967 as a modernized Smena-14 with spring motor (!!!). It seems, that LOMO engineers have tried to relegate the experience with motor-spring "Leningrad" camera into the level of cheap cameras. Although the idea sounds really great, the particular cameras was never produced (even a sigle prototype sample was never seen at the moment). I need your help here!